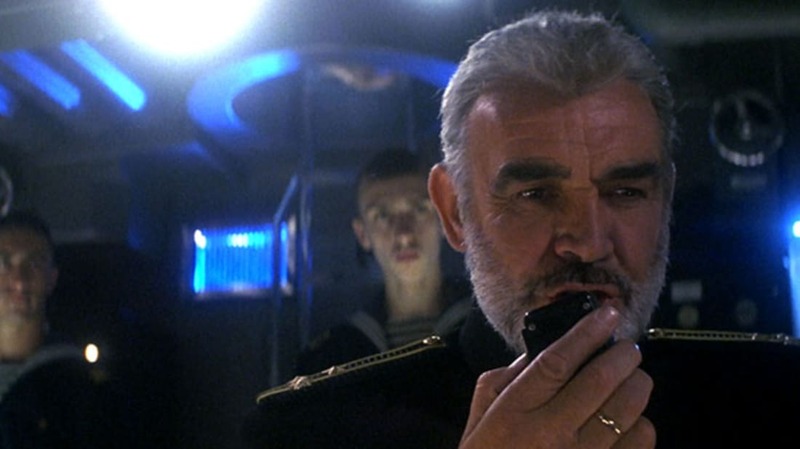 The Hunt for Red October is one of the best submarine films ever made, and a favorite of dads everywhere. It was a blockbuster when it came out (the sixth-highest grossing film of 1990), and an Oscar nominee for its achievements in sound and editing. It has Sean Connery speaking Russian with a Scottish accent, for crying out loud. Yet there is more to discover about this star-studded Cold War thriller. Let's dive deep and see what else we can find. 1. Even though the novel had been a bestseller, nobody wanted to make the movie. Tom Clancy's book is a complicated story with a lot of technical jargon, which made Hollywood executives antsy. It also made the movie hard to summarize. "In Hollywood, because of time constraints, very few people in a position to say yes to a project like this read the book," admitted producer Mace Neufeld. "They generally read the reader's report. [And] this book doesn't condense well into two or three pages." Neufeld got the project off the ground by getting a Paramount executive to read the novel—not just the book report—and see for himself how cinematic it could be. 2. Some people thought it might flop because, in the time it took to get the movie made, the Cold War had basically ended. The film is set in 1984, which is when the novel was published and when tensions between the United States and the Soviet Union were high. But by the time The Hunt for Red October hit theaters, on March 2, 1990, the Communist Party was no longer totally in control of the U.S.S.R., new democratic systems had been set up, and the old ways were rapidly dissolving. "The world has changed," said an unnamed Hollywood marketing exec in an Entertainment Weekly interview. "Gorbachev was Time's Man of the Decade. Defection is no longer an issue." It turned out not to be an issue, of course; the film did well with audiences and critics alike. 3. Sean Connery was a last-minute replacement. The film had been under production for two weeks when word came that Klaus Maria Brandauer (Out of Africa), the Austrian actor who'd been signed to play the rogue Soviet sub commander Marko Ramius, couldn't do it after all because of a prior commitment. Connery took the part instead, needing only one day for rehearsal. Coincidentally, he and Brandauer had acted together in 1983's Never Say Never Again and would reunite again for 1990's The Russia House, which was shot shortly after The Hunt for Red October. 4. Connery almost turned the movie down because of a fax error. "I had reservations about it," Connery told an Associated Press reporter upon the film's release. "I thought this kind of Cold War intrigue might be dated because of recent events. It turned out that the studio had failed to fax the first page of the script, which explained that it took place before Gorbachev." This is probably why no one ever uses fax machines anymore. 5. The film got an uncredited rewrite—including all of the Russian dialogue—from veteran filmmaker John Milius. The writer of Apocalypse Now, Conan the Barbarian, and Red Dawn—who had directed Connery in 1975's The Wind and the Lion—told an interviewer in 2003 that the rumors of his involvement with The Hunt for Red October were true. He said he added speeches for Connery's character ("Make it about me," the actor supposedly told him), and that he "wrote all of the Russian stuff—everything that's Russian in that movie." 6. It confirmed the existence of naval technology that was still classified at the time. 7. The U.S. Navy cooperated fully (and expensively) with Paramount, at least in part because of Top Gun. Mace Neufeld met with resistance when he first approached the Navy for help. But several admirals were fans of Clancy's novel, and they appreciated what Paramount's Top Gun had done for Navy jet fighters. In Neufeld's words, the Navy eventually decided that The Hunt for Red October would be a good way of "showing taxpayers where their money was going." Tax dollars weren't used to make the movie, though: the Navy charged millions for the use of its equipment, personnel, and so forth. 8. The Navy gave filmmakers access to real subs, but that's not where the submarine interiors were filmed. The USS Houston plays the role of the USS Dallas in most exterior shots, including the one where the sub does an emergency surfacing. But it wasn't feasible to shoot the interiors inside an actual sub (those things are cramped enough without adding a film crew), so painstakingly accurate sets were built based on the real thing. The sets were put on hydraulic gimbals that could be tilted to simulate motion, which Connery said made him seasick. 9. Alec Baldwin wanted to return for the sequels but was edged out when Paramount learned they could get Harrison Ford. It's complicated, and there are at least two sides to every story, but here's the gist: While negotiations with Baldwin were still ongoing, Paramount allegedly offered the part to Ford, who was a bigger box office draw and to whom the studio owed money anyway because of a previous project that had fallen through. Baldwin had been dithering over the specifics of his deal, and now a Paramount executive used that indecision to force his hand: either commit right now to an open-ended contract for Patriot Games and whatever came next, or the offer would be withdrawn. Not wanting to give up a chance to appear in A Streetcar Named Desire on Broadway, Baldwin left Jack Ryan behind. 10. Creating the right "ping" sound took forever. Sound designer Frank Sarafine told American Cinematographer that he and his team "must have created 500 different pings" before director John McTiernan found one he liked. The radar ping was manufactured electronically, using sine waves and reverb, but other sound effects were recorded from real sources. For example, the squeals and groans of submarines under stress were taken from the sounds of Disneyland's Space Mountain roller coaster cars as they go around turns. 11. That Christopher Columbus quote at the end is totally bogus. In the film's final moments, as Ramius looks forward to his new life in America as a defector, he says: "And the sea will grant each man new hope, as sleep brings dreams of home." He attributes this line to Columbus, who knew a thing or two about sea voyages and new homes. But McTiernan said in the DVD director's commentary that the quotation was the work of screenwriter Larry Ferguson, not good ol' Chris. 12. It was inspired by combining a couple of true stories. 13. The producer wanted Kevin Costner for the lead, but Costner had other ideas. As Mace Neufeld explained in a behind-the-scenes DVD feature, "I'd gotten quite friendly with Kevin Costner, and I went to Kevin about playing Jack Ryan. But Kevin was up to his neck, and very enthusiastic, about doing this ... this buffalo movie. And I said, 'You'd rather do a buffalo movie?'" The buffalo movie—which also involved dancing with some wolves—earned Costner Academy Awards for Best Director and Best Picture, so it's safe to assume he feels he made the right choice. 14. At least three of the cast members had actual military experience.